Life seemed rather boring at the Privet Drive but I bet these Harry Potter crafts would have kept even Harry himself busy and entertained. Make a few at your next Harry Potter party or any day that needs a little magic in it. 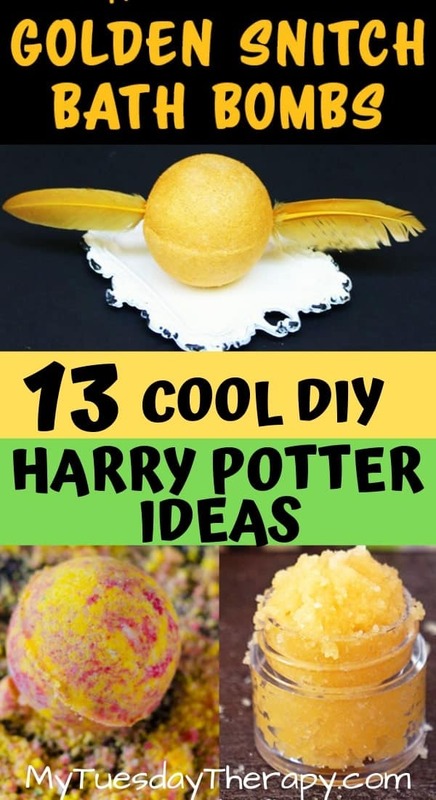 The troll bogeys can ruin your appetite but will be a Harry Potter DIY project that many kids will find fascinating. You’ll find here crafts that appeal to teens too so keep scrolling :). 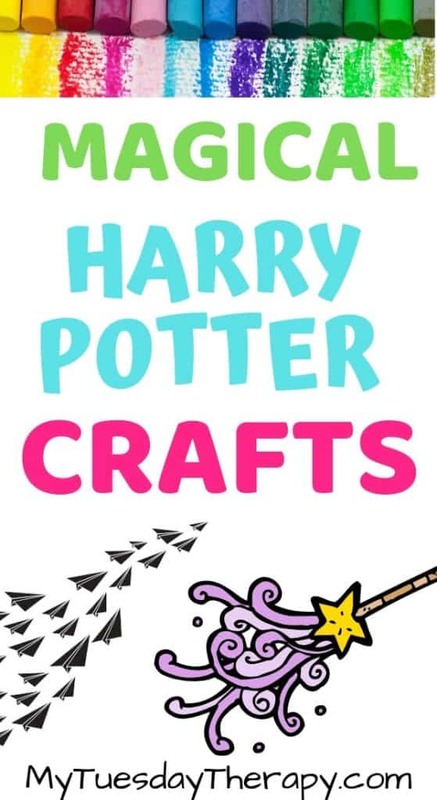 Many of these crafts aren’t just awesome craft ideas but also great GIFTS FOR HARRY POTTER FANS. You can make all sorts of stuff with Harry Potter themed charms! The set above is from Golden Vine Designs. Attach a charm to a ribbon and use as a bookmark. Put several charms on a charm chain bracelet to tell the story of Harry Potter. Use Hogwarts house colored beads as spacer beads. These beads have a fun marbled look. Loop one into a leather cord and use as a necklace or bracelet. Make ear rings. Buy inexpensive sterling ear ring hooks and hook in your charms. Make a belt with yarn, beads, and charms. Here is a basic five strand belt you can customize to your liking. 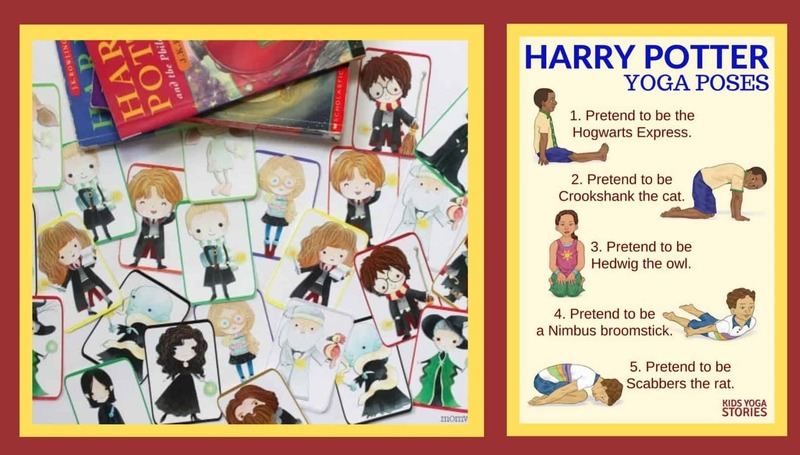 Your kids will have a great time making their favorite and the not favorite Harry Potter characters. Be ambitious and make bunch of them: Weasley family, Dursleys, all the professors etc. 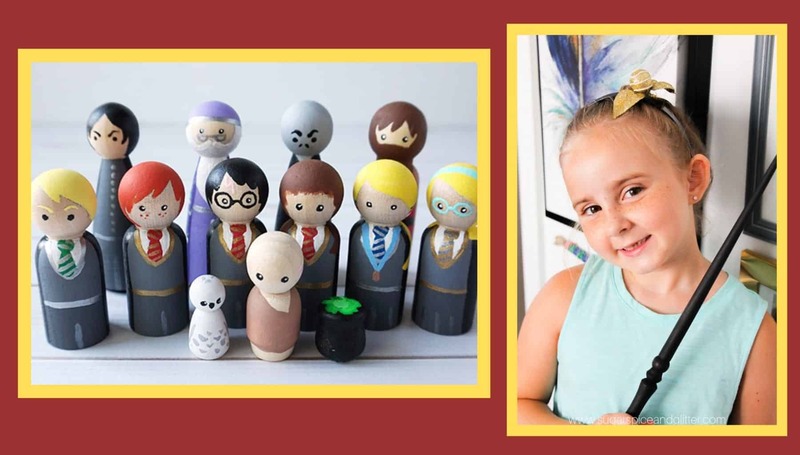 Re-enact your favorite scenes from Harry Potter with these awesome Peg Dolls from Artsy Fartsy Mama. Your kids might even want to make a video! My kids used to make videos with their barbies, My Little Ponies, and dolls. Pretty Snitch Headband from Sugar, Spice and Glitter is cute accessory for any girl. It could be the simple Halloween costume you’ve been looking for. Jennifer at Sugar, Spice and Glitter lists creative ways to use this Snitch from embellishing a picture frame to using it as a Christmas ornament. 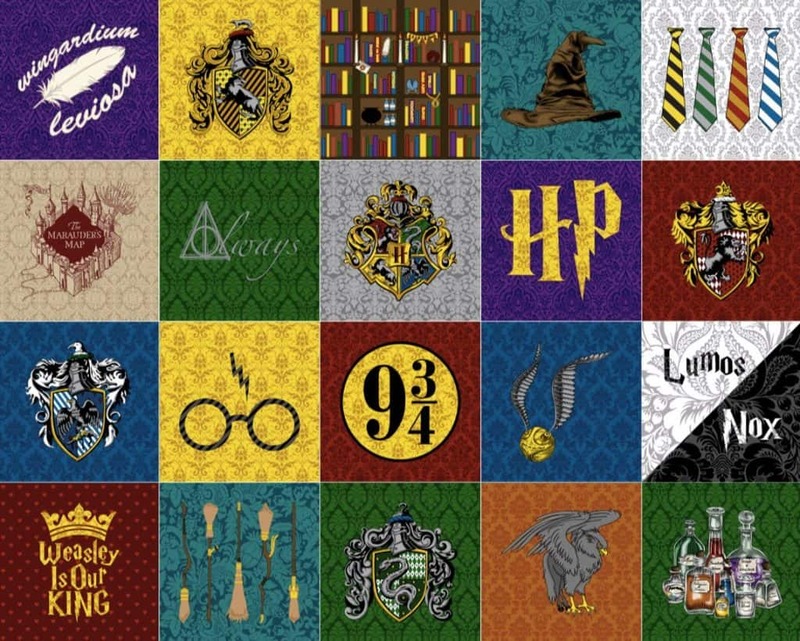 You can get these gorgeous Harry Potter fabric squares from Fandom Fabric and make your own Harry Potter Quilt. Keep it for yourself or give as a fun gift to someone. A perfect Harry Potter DIY for those who have a sewing machine! Neville Longbottom received a Remembrall from his Gran. The beautiful ball turned red when the carrier had forgotten something. Unfortunately, it did not tell what he had forgotten. Remembrall goes back to normal once the user remembers whatever he had forgotten in the first place. Even though, this DIY Remembrall from Parenting Chaos does not have magical powers it is a pretty accessory for Harry Potter fans. Perfect drink on Valentine’s Day: Love Potion from Royal Baloo. A simple, fun activity for kids. Make also pretty labels for your heart shaped bottles. How fun it would be to write a letter to a friend with a feather quill! This might get your reluctant writer to grab a quill and write a report paper! 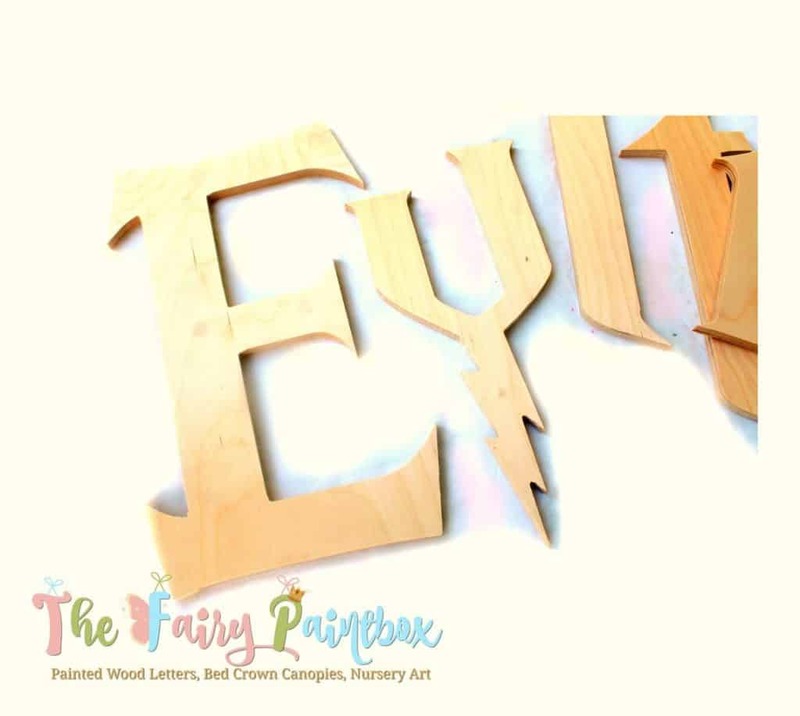 You or your kids will have a blast painting and decorating these wizard-style wooden letters from The Fairy Paintbox. Spell your name or cool phrases from Harry Potter. The letters will make a great room decor for any Harry Potter fan. 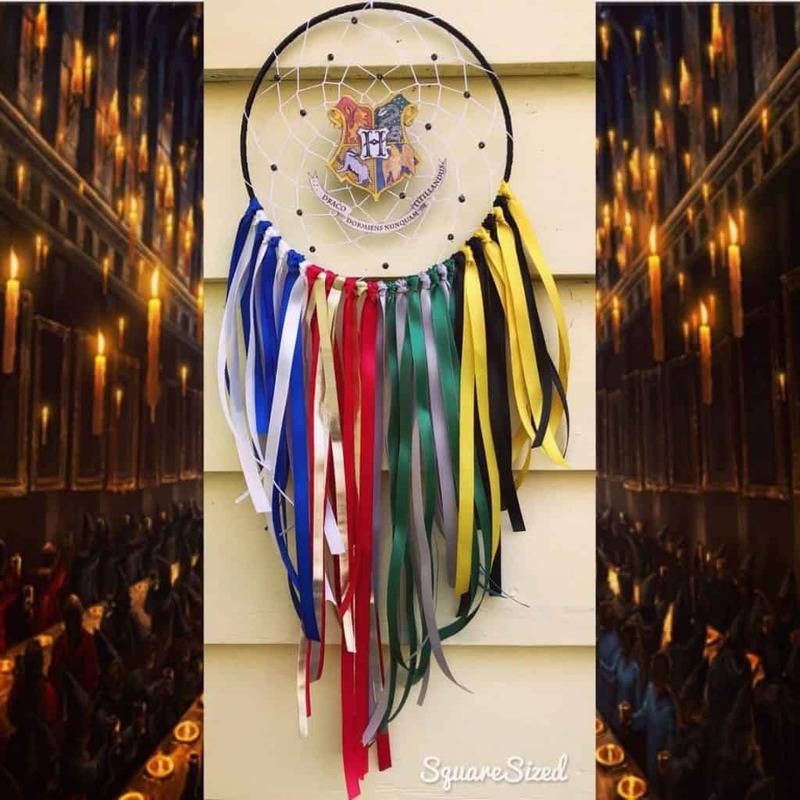 This beautiful Hogwarts Dream Catcher can be bought from Gypsy Dream Catching. It is a fantastic Harry Potter room decoration idea. Buy one and use it as a model for making more dream catchers at a Harry Potter party. Make a dream catcher with the house colors you belong to. A dream catcher is a great Harry Potter craft idea for teens. Teens would also love these Harry Potter themed party ideas from spending a night at “Forest of Dean” to dancing at the Yule Ball. Buy dream catcher rings and ribbon for an easy DIY project. Decorate photo frames or photo mats! Use your imagination and creativity and draw the most amazing images inspired by Harry Potter from eyeglasses to wands. Other ideas to draw include: goblet of fire, dragons, owls, potions, sorting hat, snitch, broom. If drawing is not your strength use theme fitting stickers. You could also write quotes on the photo mats. This would be a fun activity at a Harry Potter party. Take also a photo of each guest or a group photo so they can can put it in the frame or the photo mat. Three Birds Stencils has an awesome collection of Harry Potter stencils such as Hogwarts Crest, Deathly Hallows, and 9 3/4. You also find there a stencil for “Mischief Managed” and other fun sayings from Harry Potter. Use the stencils to create art on canvas, wood, or fabric. With these stencils you can easily make cool decorations for any room in the house. This owl pendant is so cute. 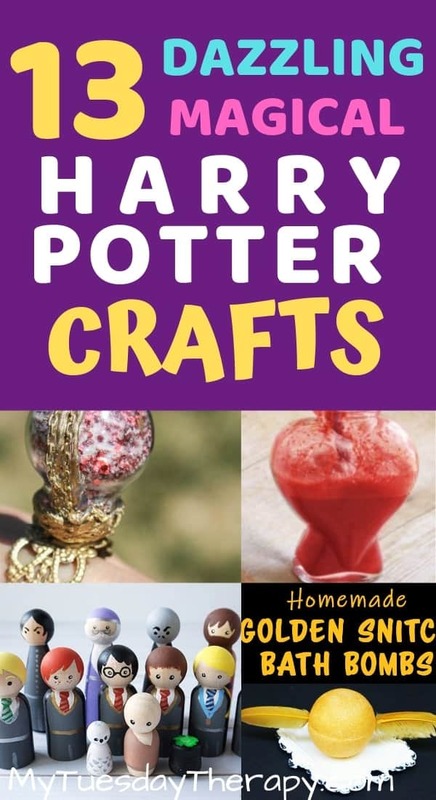 A Harry Potter craft for adults and teens! Make one for yourself or give as a gift to a friend. 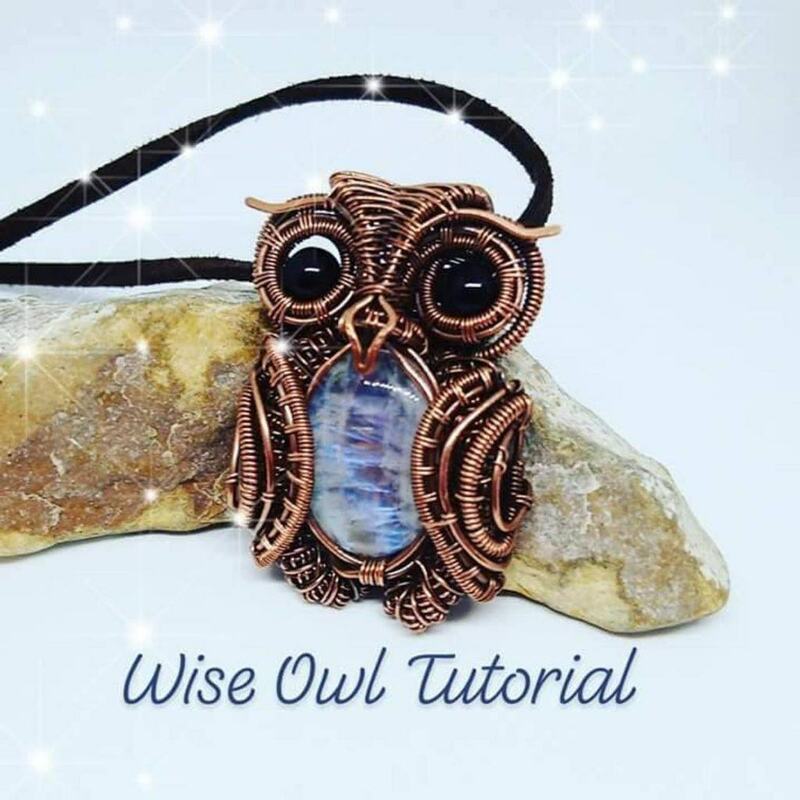 Just follow the tutorial from Anri Adachi Jewellery and in no time you will have owl pendants to fill up an owlery! You could pick a stone color based on the Hogwarts house or your birth month. Or simply pick your favorite color. What would Harry Potter fan be without a cool diy wand. Though you won’t be able to make food appear with these wands… (I wish I could), they look awesome and are easy to make. Easy DIY Harry Potter Wand from Mama Smiles is made with sticks to give it the realistic look. If you don’t have sticks around you can use chopsticks too and swirl hot glue on them to create texture. Though we have sticks around I never thought to use them and we always made ours with chopsticks, hot glue and acrylic paint. The first time we made the wands we did not use acrylic sealant and the paint began to come off. We learned our lesson and used sealant the second time. With these awesome Harry Potter wands from Steam Powered Family you can turn on light! This project is not for little kids but tweens and teens might enjoy it. You will need things like copper tape and batteries but it is not a super complicated craft. And if you homeschool this would be a great science project! Learning can be fun!! Little ones will enjoy making these glittery Harry Potter wands from Me and My MerBaby. Simple afternoon project for kids or an awesome party activity. These crafts are perfect for booklovers! I’d like to think that Harry Potter fans enjoy reading at least Harry Potter books. Your kids can make these for themselves or give them as gifts to Harry Potter fans. Either way it is a fun DIY activity. Harry Potter books are so thick that they are impossible, at least for most of us, to read in one sitting. Cute bookmarks with friendly faces of Albus Dumbledore and the awesome trio: Harry, Ron, and Hermione will mark the place for you until you are ready to get back into the magical, mysterious Wizarding World. Check out the free printable at Artsy Fartsy Mama. If cutting out the bookmarks does not count as a craft for you, you can make simple bookmarks out of cardstock and draw the Harry Potter characters on them. and bring this awesome Harry Potter Book Tote with you! Write or draw on the canvas book tote but if you would like to use the “I solemnly swear, I’m up to no good” printable from More Than Homeschool Mom you can find it here. Brilliant ideas for Harry Potter quiet book. 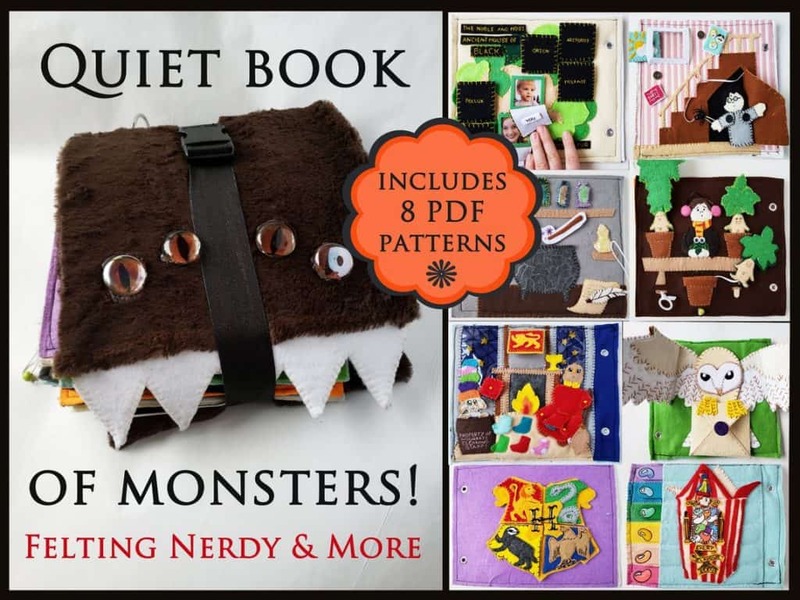 Get the quiet book pattern from Felting Nerdy and More and make this awesome book to keep your little one entertained. Fun pages such as Herbology class and an owl delivering a letter for your child to explore. This would also be a great Harry Potter gift for toddlers. Is any kids craft post complete without slime ideas? I don’t think so. Since slime is still a popular thing among kids I’ll present you a couple of fantastic options. Both of these are from Steam Powered Family. Butterbeer slime looks like marshmallow creme but it is not so don’t attempt to eat it no matter how tasty it looks. If making it makes you want to have a glass of refreshing butterbeer check out these MAGICAL BUTTERBEER RECIPES. I’m pretty sure this magnetic slime will not tempt you to eat it but I think your kids will have a blast making it. After making Troll Bogeys you might feel like you need to take a bath or use sugar scrub to make your hands soft and clean again. This awesome Snitch Bath Bomb from Steam Powered Family is a cool activity for teens and tweens. Make these for a fun and relaxing bath time or give them as gifts for your muggle friends. And here is another bath bomb from Lara Molettiere. The one in the picture above is for Gryffindor. By using various color combinations you can match them with your favorite Hogwarts House. This would be a great surprise for those whose house you know! This Butterbeer Sugar Scrub from Happiness is Homemade is actually for lips but can of course be used for hands too. The butterscotch extract gives it a nice flavor. Winter time and some cosmetics can dry up your lips. This lovely sugar scrub is a fun and tasty way to keep your lips soft and smooth. Too bad the Remembrall Ring won’t help you to win this classic game. Of course, it is good to exercise the memory without any magical tricks. So, put your brain cells to work and play a few rounds of Harry Potter memory game. You’ll find the printable at Mom vs The Boys. And talking about exercise. Get moving with Kids Yoga Stories. A fun way to gently introduce the kids to the art of yoga. These moves look like something I could do too! Which reminds me that I seriously need to do something before I lose all the flexibility I had. And after a yoga break it is time to learn with a fun Wizard Learning Pack from Lara Molettiere. 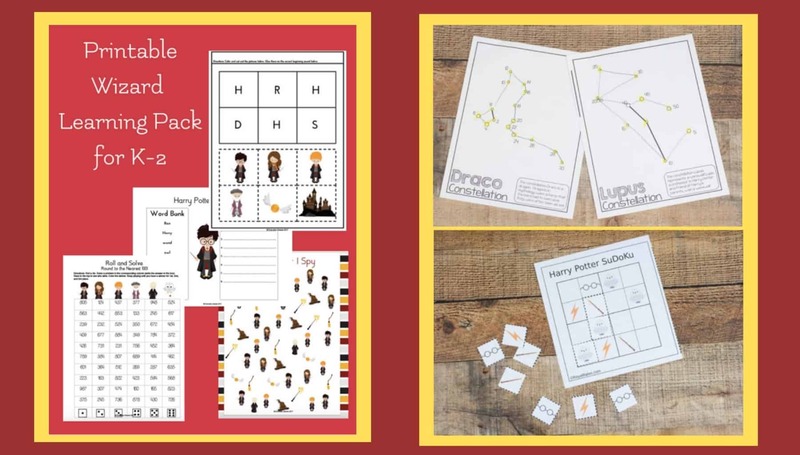 Your little Harry Potter fan will have a blast learning with his favorite characters. Its good for every muggle to put the brain to work and these worksheets will do that in a fun way. Print out a few for your next road trip or or put them in a Boredom Buster Ideas basket. Harry and the other kids in the Hogwarts studied astronomy. It was not an elective but one of the required subjects. Perhaps your child is interested in learning about stars, planets, and constellations. These simple worksheets by Royal Baloo can get him started. You’ll find there also sudoku and logic puzzle activities that can be quite fun to do. I like how this sudoku is like a puzzle. You don’t need a pencil or eraser. Just simply put the sudoku pieces in the correct spots. They are easy to move around if you don’t get it correct the first time.